It’s 1986 in California. A group of friends will live the Summer of their lives after a mysterious discovery in their town’s woods. They will find an artifact whose powers they don’t understand and that will make them defy the laws of Nature, allowing them to interact between two planes of reality: life and death. This will trigger a series of unexpected events that will get them involved in a US Government conspiracy and a mysterious General who has his own plans. An adventure that will change their lives. The game is an Action RPG with orthogonal 2D view with an 80s looking style, slightly similar to classics like Legend of Zelda or the most recent indie game Hyper Light Drifter. Control Chris, Charlie, Mathew, Kevin and Big Joe in the adventure of their lives. Each one has different abilities and weapons, which will have to be mixed in order to overcome all the challenges that are waiting for them. Explore, fight, run and interact with characters from different times to achieve your goal, saving the world. A 14 years old adventurous boy capable of hitting 10 times in a row without missing. He likes to chew gums, solve riddles and looking brave in front of his neighbor Charlie. A girl with plenty of character. She always has the last word. And, usually, she’s right. If she doesn’t convince you with her sweet voice, she’ll do it with her whip-rope. He’s not fat, he’s strong! And he can prove it whenever he wants to. Dreams about beating Larry Bird and celebrating in Tujunga Burguer. The inventor. Numbers are his main weapon. With the neccesary materials, he's able to build anything with his imagination. Ignorance drives him crazy. The youngest in the group. He’s Chris’s little brother and he only wants to be like him. He’s never been afraid of anybody! But he always causes problems to their friends. We are an indie videogame studio called Fourattic, from Seville, Spain. We are four guys who left their previous jobs to do what we love the most: creating games. We are working full time on this to make it happen. 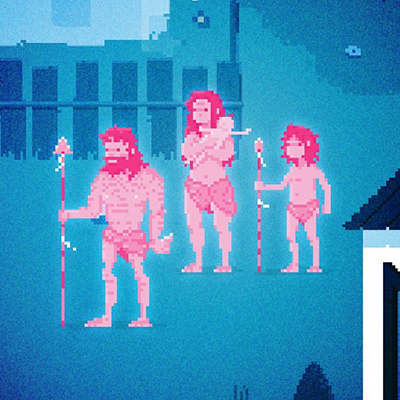 We chose pixel art because we think it has the retro essence we’re looking for. 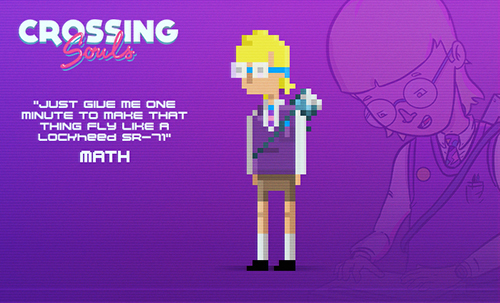 The art is very influenced by games like Sword and Sorcery and Hyper Light Drifter, but with an 80s style. The game is being developed in Unity 2D, but it’s still in a very early stage of development. We will be updating with details as soon as we can. The story is inspired in films like The Goonies, E.T, Explorers and Super 8. Please, feel free to share your thoughts. We want to hear it. We have posted a weekly reports with all the things that we were doing in our precampaing for Kickstarter. You can read them and find out how we're building this. We post a new one every Sunday. What's the setting/world gonna be like? Earthbound like at all? Chapter based? Zeldaesque overworld? I like this idea so far. Cool idea and very nice artwork. The most important thing for us is the plot. The world will be "divided" in chapters, you can fully explore closed (but big) areas like an entire forest, some villages, caves... and will find all kinds of activities like fights, puzzles, npcs to talk with.. but everything is there and happens for the main reason: the story, so you can't go back at certain moments of the game. These are a couple of screenshots that we've already posted on twitter and facebook last week. This is a first look of our bad guy. It seems really evil, right? The Goonies, that completely bought me! Good luck guys, this project is really cool. Ill be following this. Here is our lastest #screenshotsaturday: Ghosts in da hood! We're working hard to post some locations soon. 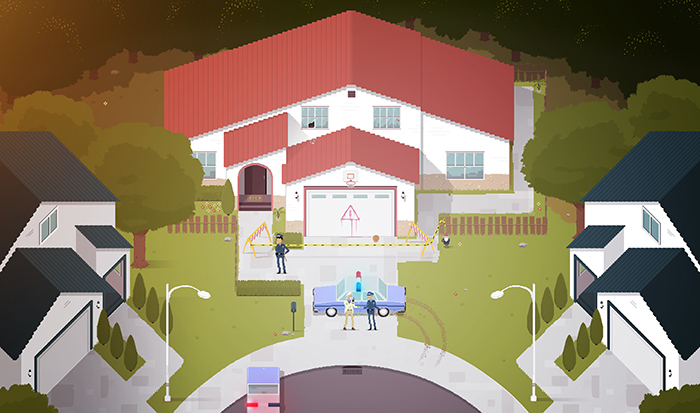 Here is a work-in-progress piece of our game's scenario. One of our main character's house has been assaulted and they dont know if his family is ok. You will have to avoid the cops and find a way to step in. 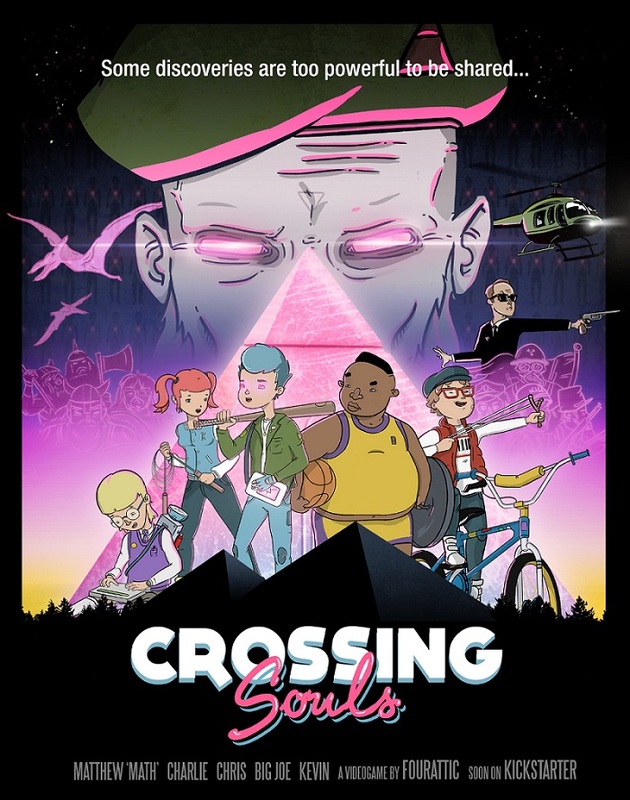 This will be one of the ways to play Crossing Souls. Beware... Cops will be watching. Here's a wider view. Click here to enlarge. Nice work keep it up! Hard to have a good glance without demo or gameplay captures available, but that pixel art and animations sure do rock. Thanks for your feedback guys! We're working hard to show you some gameplay. Unfortunately, we have lot of things to do before that. We'll show you more as soon as possible. Stay tunned! So nice to see small Spanish indie studios popping out from everywhere! I love your 80's style poster. When you finish the game you should sell the poster as well. We'll improve it and set it like one of our rewards. Glad you like it guys! So how does the gameplay work? Could you describe how you'd play that home assault scenario? Visit Indie Game Enthusiast or follow me @IG_Enthusiast to learn about the best new and upcoming indie games! Hi guys, I'm one of the developers working on Crossing Souls. Thanks to all of you for your kind words! We're working really hard to get some gameplay preview ready prior to the kickstarter campaign. The game is basically a 2D-zelda-style with some new gameplay features: on the one hand, you can "swap" between main characters during the gameplay. Since each one have his own "set of abilities" such as "opening closed doors" (Math), "pushing heavy objects" (Big Joe), etc, you will need to use each one at certain moments to overcome puzzles and enemies. On the other hand, you can also "swap" between 2 different "dimensions", the living and the dead one, where you will find all sort of ghosts who you can interact with (or fight with). The screenshot shown above is a WIP, it's more like an "cutscene" where the police is talking about the situation and you can read it. It's a way of expanding the plot and get some character's background and motivations as we think plot is very important. We would also like to add "2D-art animation cutscenes" but it will depends on the time we have.